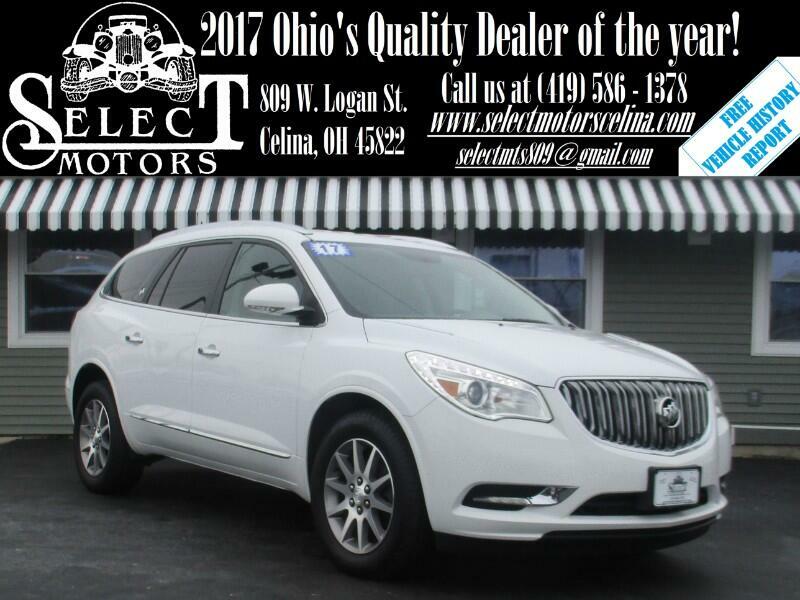 ***TXT US @: (419) 362 - 6200*** Backup camera/sensors, power lift gate, automatic headlights, automatic dimming mirror, Home Link, heated/signal mirrors, dual automatic climate control, power windows/locks/mirrors, keyless entry with remote start, AM/FM, SiriusXM, auxiliary and USB port, steering wheel mounted audio controls, Bluetooth, dual power seats with power lumbar, tilt and telescopic steering wheel, cruise control, information center, 19" alloy wheels. Fuel Economy: 17 city / 24 hwy. Warranties: Balance of 4 years or 50,000 mile bumper to bumper and 6 year or 70,000 mile powertrain. In service date: 07/08/2016. Extended service contracts available. The 2017 Buick Enclave is a three-row crossover available in three trim levels: Convenience, Leather and Premium. Every Enclave comes standard with second-row captain's chairs and seven-passenger capacity. A second-row bench seat, which increases passenger capacity to eight, is optional on the Leather and Premium models. Standard equipment for the Convenience trim level, which is only offered on front-wheel-drive versions, includes 19-inch alloy wheels, automatic xenon headlights, heated side mirrors, rear privacy glass, a power liftgate, rear parking sensors, remote engine start, tri-zone automatic climate control, an eight-way power driver seat (plus two-way lumbar adjustment), a two-way power front passenger seat, a leather-wrapped tilt-and-telescoping steering wheel, cruise control and an auto-dimming rearview mirror. The list of standard electronics includes OnStar telematics (with 4G LTE and onboard Wi-Fi hot spot), Bluetooth phone and audio connectivity, a rearview camera, a 6.5-inch touchscreen display, Buick's IntelliLink interface (which includes voice control and smartphone radio app integration), dual USB charge ports, and a six-speaker sound system that includes a CD player, an auxiliary audio input jack, a USB audio interface and satellite radio. Stepping up to the Leather trim level adds leather upholstery, heated front seats, eight-way power adjustment for the front passenger seat, a heated steering wheel, driver memory settings and a blind-spot warning system with rear cross-traffic alert. The top-of-the-line Premium model includes all of the above, plus 19-inch chrome-clad alloy wheels, adaptive headlights, power-folding mirrors (with auto-dimming on the driver side), forward collision alert, lane departure warning, ventilated front seats, a power-adjustable steering column, a navigation system and a 10-speaker Bose surround-sound audio system. Options on the Leather and Premium models include 20-inch alloy wheels, a dual-panel sunroof, a rear-seat video entertainment system and a towing package. The available Tuscan Edition and Sport Touring Edition packages provide distinctive trim and wheels with bronze and satin black finishes, respectively. All 2017 Buick Enclaves come with a 3.6-liter V6 that produces 288 horsepower and 270 pound-feet of torque. A six-speed automatic transmission and front-wheel drive are standard, and all-wheel drive is optional on Leather and Premium models. Properly equipped with the optional towing package, the Enclave can tow up to 4,500 pounds.